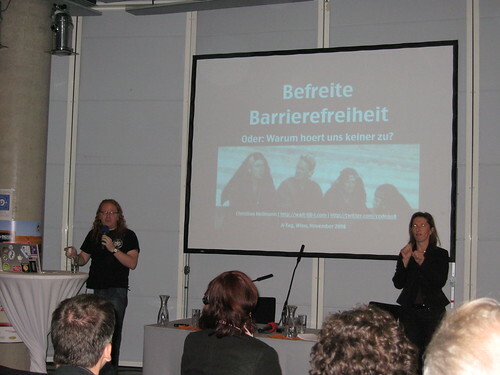 Gestern war ich in Duesseldorf um bei der diesjaehrigen Best of Accessibility in meinem Vortrag “Barrierefreiheit im Netz der Daten” ein paar der Mythen ueber das Thema zu verwerfen und hoffentlich den Teilnehmern der Konferenz ein paar Ideen zu geben. Da mein Leben derzeit hauptsaechlich aus Reisen besteht kam ich direkt von Flughafen zu meinem Vortrag und verpasste leider den Grossteil der Konferenz. Allerdings kam ich noch rechtzeitig fuer einen Kaffee und ein Stueck Kuchen vor meinem Vortrag nachdem ich den Organisatoren dann doch fuer einige Zeit zum Schwitzen brachte. Sorry. Als kleine Wiedergutmachung gibt es hiermit einen gar seltenen deutschen Blogpost und sowohl den Vortrag als PDF und aus Audioaufnahme. Ich kauderwelschte gar gewaltig, aber das passiert eben wenn man zu lange im Ausland lebt. Ich hoffe das die Teilnehmer der Konferenz etwas fuer ihr Geld geboten bekamen und am naechsten Tag ihrem Chef etwas Neues beibringen konnten. Fuer Fragen und Anregungen bin ich fast immer auf Twitter unter @codepo8 zu erreichen. I’m just looking out of the window at the snow on my balcony (in London! ZOMG!) and try to wrap up my quick trip to Vienna to attend the A-Tag conference which was an accessibility event sponsored by both Austrian government organizations and commercial partners. The motto of the conference was “The Future is now” and thus the main sponsor was the organization in the Austrian government dealing with youth matters. This is a great idea as it meant that first of all the accessibility argument is taken outside of the disability camp but into the area that we have to deal with much more – the youth of today and its education but it also meant that people are more likely to listen to a government body than just bloggers or IT company representatives. The conference had two tracks and here’s a quick roundup of the talks I attended. The conference started with Eva Pabst, a blind presenter from accessible media welcoming everybody and setting the scene. Following was Robert Lender talking about the idea of bringing accessibility and youth work together and doing an admirable job in presenting the plea for collaboration. My hat is off to Robert (and he did the opposite by putting on the blue beanie after stating it’ll look silly) and I am helping him right now to create a youth oriented search engine using Yahoo BOSS. Shadi Abou-Zahra of the W3C was next explaining all about WCAG2. This was a bit on the dry side, but there is not much you can do when talking about a massive topic like this and Shadi is great to ask all kind of detailed questions when you cornered him in the breaks. Good to have people telling how to convert from a WCAG1 based testing methodology to the more human WCAG2. I then skipped two presentations to chat with people outside and discussing the idea of an Austrian Scripting Enabled with some of the people. I got back on the tracks after lunch to see Martin Kliehm talk about WAI-ARIA and how to use it now. Despite the rather creepy factor that most of his slides featured my name or photo in one way or another Martin did a great job explaining the technical details of WAI-ARIA and showed his code solutions for it. One thing that is a bit of a shame is that him showing how complex it can get to write your own keyboard access solutions might have spooked the audience, so I made sure to explain that all the large widget libraries I know are working on ARIA implementations already, so you don’t have to be a Martin to use it. Eric Eggert filled in for Tomas Caspers who couldn’t come because of company demands and was sadly missed talked about the seven deadly sins of accessible webdesign mapping the bible sins to bad examples of accessible solutions. 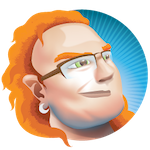 These ranged from terrible solutions like contrast widgets that only changed the contrast of the widget itself up to 1000 character table summaries that didn’t explain what the table was about. Eric also segwayed nicely to my presentation by telling people off for discussing things for hours instead of just doing them. The conference presentations ended with my own plea for better communication between the accessibility world and the web development world out there. The slides are available on slideshare (this is the English version, but there is also a German one. If you don’t want to sign up for slideshare to download the slides, get them from S3: German, English. The organization of the conference was flawless and went without a hitch. The catering was marvelous and Vienna itself is a beautiful, easy to navigate town full of coffee houses and bakeries. Please London, take these on! I have to thank the organizers, Eric Eggert, Accessible media and the dynamic duo of Markus and Martin Ladstaetter of Bizeps for a great conference. I was also very impressed with the live transcription to sign language and the professionalism this was done with (I had a good talking to before my talk to speak much slower and hope I pulled it off). On a personal note one of my highlights was being able to have a long chat (with aid of the sign language translators) with several hard-of-hearing attendees (including the terribly inspiring Manfred Schuetz) which helped me to understand their concerns and give them some ideas how to get the need for proper captioning and transcription to sign language out there. It was a good time and if you speak German and you care about accessibility, give A-Tag a go next time, it is well worth it.